Divers call it Tiger Beach. A lot of very big sharks call it Home. Lodging: Our dive boats depart for Tiger Beach from the Marina at Old Bahama Bay Resort. We suggest you stay at the resort, enjoy their first class accommodations, and take advantage of the convenience of rolling out of bed and walking right over to our dive boat. You are free, however, to stay wherever you wish. Perhaps you'd like to overnight on your own boat at the Marina or stay in nearby Freeport. Dive Requirements: No dive certification is required. You'll be required to supply your own mask and we recommend a 3 mil wetsuit. Note: Passport required. 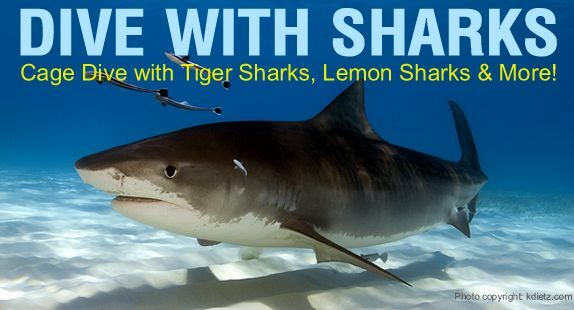 Shark Guarantee: We cannot guarantee you'll see Tiger Sharks. If you don't see sharks, there is no refund. We can promise you we'll take you to the best possible locations for viewing sharks and do everything in our power to make sure you have an incredible adventure in the Bahamas. We suggest a minimum of two dive days for the best odds of photographing big sharks. The Weather Warning: The best months for viewing big sharks tend to be the worst months when it comes to weather. We strongly encourage you to have a back-up day in your vacation schedule "just in case", and recommend the purchase of travel insurance. Shadow Boat Services: Taking your own yacht to the Bahamas? If you’d like a private shark diving adventure for your family, friends or corporate group let us know. We can bring our shark team to your boat. We can provide all that’s needed for a great day, including a dive instructor, shark cage and a hookah system. Scheduling is flexible. Call for pricing.